Today was my longest run of the week and I knew I'd be doing it somewhere on the Bethpage bike trail. I just didn't know when or where I'd start. GLIRC had a clubhouse run scheduled for this morning and I considered joining them for that. Those runs start at 8:00 AM sharp in the parking lot of the GLIRC office in Plainview. I wasn't in the mood for running with a big group, so I decided to skip that event and do my long run solo. TPP was also doing her long run at Bethpage today and I'd hoped to cross paths with her at some point. We did end up finding each other on the trail (she was easy to spot in her vivid pink running gear) and we ran together a bit. TPP was having a tough time this morning and decided to head back to her starting point. Despite that, she ended up covering almost 8 miles. The Hal Higdon plan called for 8 miles today, although my ER plan had me down for 9. 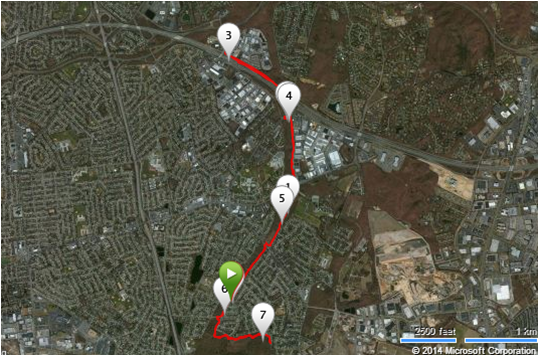 Since I ran 7 miles last Sunday, I decided that eight was enough <smiley face> today. I recall from my last half marathon training cycle that the challenge of going from 5-6 miles to 8-10+ took some acclimation. I was concerned that I'd hit the wall after 45 minutes or so, but I never felt depleted. I stayed around 80% of max HR throughout the run, largely due to maintaining an easy, but steady, pace. 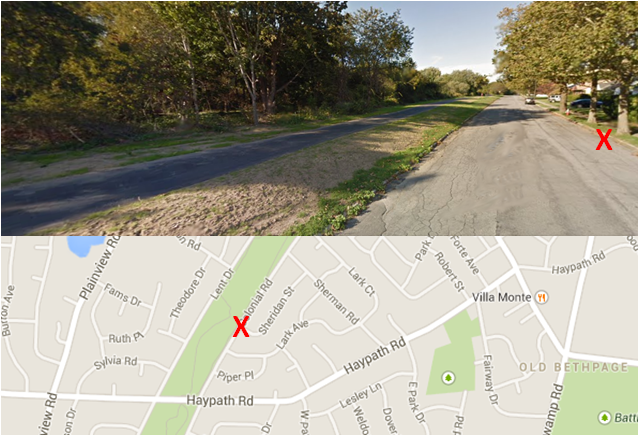 Before I took my first step on the Bethpage bike trail, I had a frustrating experience trying to find a place to park my car. I'm planning to get a 2014 Empire Passport so I didn't want to pay the Bethpage parking fee today. I was hoping that they weren't charging for entrance this morning, but when I arrived I saw that the toll house was open for business. I thought about other options and turned around. I then drove to the small lot that is located off E. Bethpage Rd near Old Country Rd. When I arrived at this lot, every one of its ten or so spots was filled. So much for that. I was 30 minutes past my planned start time and still had no place to park my car. I was going to park along Haypath Rd. but I wasn't sure that was okay. I then noticed some cars with people who looked like runners parking along Colonial Rd and found a spot near them. I took care to see any signs restricting parking along the street. Seeing none, I parked and crossed the road to the bike trail. It was only a few minutes after that when I saw TPP. Despite her claim that she was struggling, she looked strong as I watched her coming south in my direction. I wanted to follow the trail north all the way to Sunnyside Blvd. After a few minutes of running in that direction, TPP decided to head back to the lot where she'd parked. She's really cut down on simple carbs and sugar and has been having trouble maintaining her targeted performance levels. I'm confident that will soon change. I wasn't thrilled about covering the section of trail north of Washington Ave because it has a series of long hills. It was no picnic, but I did better than expected. I'm sure last weekend's hilly workout helped prepare me for today's. The only difficult times were when I was coming up steep hills against 12 MPH winds. 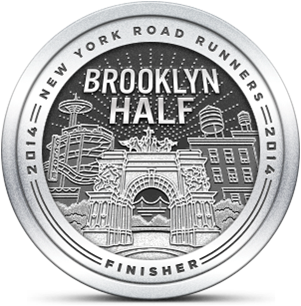 I maintained the best pace I could, shortened my stride and got through those situations fairly well. It takes a while to cover eight miles and I ended up needing to go south of my starting point to pick up miles 7 and 8. That took me close to the start of the north trail. I kept waiting for my energy level to drop but it never wavered, except when I was a couple of tenths away from my finish point. That was obviously a psychological response to almost being done. This training program has been nudging my weekly mileage beyond my average of 18. The past couple of weeks were 21 miles and this week I covered 23. That was with two rest days instead of my usual one, meaning my average run length has increased measurably since I've started training for Brooklyn. Oh, that's wonderful! I'm very happy you had a great run today. I'll need to start parking elsewhere too, if I decide not to get a pass. Don't we miss SIOR??? Yes we do. She puts the Run in Runsketeer. You guys are too sweet! This training is starting to pay off. That's wonderful that you felt great throughout. Enjoy your rest day tomorrow. Are you going to do any tube up races before Brooklyn? I think you should to give you a better idea of what your goal should be. I'll do one with you. Maybe the first or second weekend of May? TPP? Okay, that could be an option! I'll see how I feel. It's a really nice event. Fairly small and family friendly. They have a fun run for kids first, perfect for your middle two. The grownup race starts with a long hill, but then it's a really fast course for the second two miles. Maybe I'll just take pictures like last year. Oh that's right - you got all those great shots. It would be a good warm up for you for Brooklyn if you decide to run it.